Samantha really enjoys writing for her school newspaper, particularly when she’s assigned to write with Michael Lawrence, who happens to also be her crush. She’s thrilled to work with him—but less thrilled to realize they disagree on how the article should be written. The topic is whether students should pay for extracurricular activities, such as sports, and Samantha thinks it’s a good idea. After all, baseball isn’t as important as math or language arts, she argues. But try telling that to the star pitcher on the school’s baseball team! Maybe Samantha’s headline should be Trouble in the Newsroom! 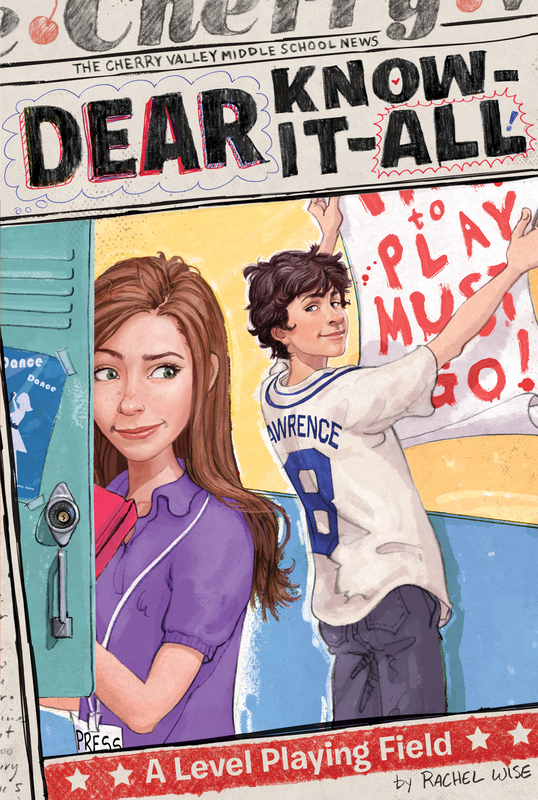 All’s not fair in love and journalism in this newsworthy addition to a tween-savvy series. A Level playing Field Chapter 1 MARTONE AND LAWRENCE: TOGETHER AGAIN! Michael Lawrence is the best-looking boy at Cherry Valley Middle School, and he loves me. Ha! That got your attention, right? It’s what’s called a great “lead” in a news article. The first line in any article is the lead, and it’s meant to capture the reader’s attention right from the start. I love writing leads almost as much as I love writing headlines. I write headlines in my mind all day, just kind of narrating the action of my life. Headlines are short and snappy and fun to write, but a lead has to really draw you in and make you want to read the entire story. Unfortunately, this lead is not true. Michael Lawrence does not love me. Or I don’t think he does, anyway. But now that I have your attention, let me flesh out the who, what, when, where, and why of my news story, just as my teachers at journalism camp taught me. My name is Samantha Martone. I am a student at Cherry Valley Middle School, where I write for our school newspaper, the Cherry Valley Voice. I think I’m a pretty normal middle school kid. My best friend since kindergarten is Hailey Jones. My older sister, Allie, goes to high school and is perfect, which is a pain. I live with her and my mom on Buttermilk Lane. I have a really big secret. The secret is, I am Dear Know-It-All! I guess I should explain who Dear Know-It-All is. Dear Know-It-All writes the advice column in the Cherry Valley Voice. Every September, Mr. Trigg, the newspaper’s advisor, picks a different person to write the column for the year. And this year he picked me! The only hitch is, you can’t tell anyone it’s you if you’re picked. You have to stay anonymous. Well, actually, there’s one other hitch. Writing the column is really hard. Oh, and one more major hitch: so is picking which letter you’re going to answer in your column each issue. When things get really hard, I sometimes think of quitting. But honestly, writing the column is kind of interesting, and also, I really, really want to be editor in chief of the Voice next year, and quitting Dear Know-It-All would totally take me out of the running. And most of all, I really like writing a column that everyone in school reads. I mean, it’s really the first thing people turn to when the new issue of the Voice comes out every other week. And everyone talks about it too. See, the most gratifying thing for a journalist is to know you’re writing interesting stuff that people are reading and talking about. That’s why I know in my heart I’ll never really quit being Dear Know-It-All. Oh, I also write regular articles for the paper. I know people read those, too. My best ones are the big investigative pieces I write with my writing partner/lifelong crush, Michael Lawrence. The good news is that Mr. Trigg thinks we’re a great team, so now he assigns us to report together for almost every issue of the paper. The bad news is that Michael is so cute it can be distracting. The other bad news is that he insists on calling me “Pasty,” the nickname I got in kindergarten, thanks to a paste-eating incident. (It looked just like vanilla frosting!) And we often disagree on things. He can be annoying sometimes. On the plus side, though, since we work on so many stories together, I get to hang out with Michael Lawrence a lot. For example, I’m going to see him in just a few minutes! We’re about to have a newspaper staff meeting. Right now I’m in the Voice office, saving a seat for Michael. But he’ll probably be late (as usual) and five different people will ask if anyone is sitting in the seat I’m saving, and when I say yes, they’ll scowl at me and then he’ll get here so late that he won’t even be able to get from the door to the seat I’ve saved. I usually try to sit near the door so he can just quietly slink in and sit next to me, but somebody else always seems to get to that seat first. If only Michael could get here on time for once in his life! See what I mean? I’m annoyed at him already and he’s not even here yet. But at least I’ll get to hang out with him for a little while afterward. I hope he’s wearing something blue today. Blue matches his eyes and makes them really sparkle against his dark hair and tan skin. Swoon! At 3:00 on the dot, Mr. Trigg called the meeting to order and began asking for article ideas. Kids were raising their hands and tossing out topics, and the whole group of us made comments. I love being in the newsroom. The energy, the team feeling, the smell of toner . . . it’s a happy place. I had finally given up and released Michael’s seat to an eighth grader when he snuck in the door and quietly pulled it shut behind him. He looked over at me and raised his eyebrows in greeting, then looked around the room. It gave me an extra second to check him out, which is my favorite pastime. Tall, long legs, dark wavy hair, bright blue eyes, a dark BLUE (yes!) short-sleeve T-shirt over a long-sleeve light BLUE (yes!!) shirt, plus tan corduroys all add up to major cuteness! He glanced back at me in his scan of the room, and I looked away, blushing for getting caught staring at him. He crossed his arms and leaned against the door, biting his lower lip in a serious, Brad Pitt kind of way. I could see his arm muscles through his sleeves. Sigh. Michael is a major jock. He plays varsity football in the fall and varsity basketball in the winter, and he is cocaptain (with an eighth grader!) of the varsity baseball team in the spring. All of this contributes to his hunky bod and graceful coordination. I, on the other hand, am so not a jock. I am a superklutz and not even that big of a sports fan. My best friend Hailey is a jock too. She’s cocaptain of the girls’ varsity soccer team, and she and Michael have this kind of macho jokey athletic relationship that sometimes makes me feel jealous and left out. Anyway, I’m more of a bookworm. I love reading and writing and quiet activities, and I don’t really see why people think it’s so fun to run around and get all sweaty. It seems like a lot of pointless effort to me. I’m just saying. I turned my attention back to Mr. Trigg, who was going through the week’s assignments. “Righty-ho, we have Susannah on the new safety patrol regulations, Tyler is covering this week’s performances of the school concert, Amy is doing a piece on the new Learning Center. I need one more meaty article up front. Any ideas?” He looked around the room. I looked with him. Besides the Dear Know-It-All column I’d have to write, I was fresh out of ideas and hadn’t heard anything too inspiring from the crowd today either. Some weeks are just slow news weeks. There’s nothing you can do about it. But then there was Michael, raising his hand. “Mr. Lawrence, yes?” said Mr. Trigg, adjusting his Union Jack tie. The Union Jack is the British flag. Mr. Trigg is British and is obsessed with World War II, Winston Churchill, and British tabloid newspapers, not necessarily in that order. Ho hum, I thought. Who cares? I’d pay for our school to not have after-school sports. Then I could hang out with Hailey or Michael after school anytime instead of waiting for them to finish running around and getting all grimy. By “partner in crime,” I knew he meant me. I didn’t want to smile, but it was hard. Trying to look serious, I nodded at Mr. Trigg, then I turned to look at Michael. He nodded at me and Mr. Trigg. Martone and Lawrence: Together Again! I was ecstatic! Not only do I love, love, love Michael Lawrence, I love, love, love writing stories with him. Even though he calls me nicknames, and I usually do klutzy stuff in front of him, and I’m always hungry and my stomach makes a lot of noise when it rumbles . . . except for all that, I love working with Michael Lawrence. I imagined another headline: Martone and Lawrence: A Modern-Day Woodward and Bernstein! Woodward and Bernstein were the famous journalists who reported some illegal stuff President Nixon was doing in the 1970s. Nixon ended up resigning because of what they reported. Anyway, Woodward and Bernstein were, like, the best investigative reporters ever, and I want to be just like them. When the meeting broke up, Michael was waiting for me by the door. “How’s it going, Pasty?” he asked. “Good, Mikey,” I replied, calling him by the family nickname that I once heard his mom use. Two could play at this game. “All right, that’s enough of that,” he said, but he was grinning. “So how do we get started?” I said. I rolled my eyes. “All play and no work makes Mikey a dull boy,” I teased. He laughed as he walked away, and I tried not to swoon.